Leave your boat at home and still plan a day of great fishing on the tannic waters of Lake Woodruff, Lake Dexter, the Norris Dead River or the St. John’s River. 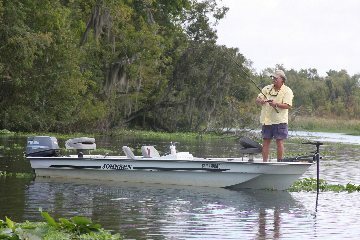 Highland Park Fish Camp has a variety of boats in our rental fleet. We have 15 and 25 horsepower Yamaha outboard motors on 15 foot fiberglass boats; and 50 horsepower with trolling motor on our 16 foot bass boats. We sell live bait in our tackle shop and have rod and reel rentals available. All of our boats come with the proper safety gear. There is a cash security deposit required the day of rental.